As a health advocate, I research a lot of ancient herbs and plants. China and India are both well known for using herbs and plants in their traditional medicine, but I’ve always had a fascination with ancient Egypt. I once did an assignment on the country, and that’s when I first learned about a powerful ancient Egyptian healing plant—the black seed. Although this annual flowering plant is known primarily as black seed, other cultures may refer to it as onion seed, black caraway, black cumin, black sesame, Roman coriander, or by its botanical name, Nigella sativa.The first use of black seed dates back to ancient Egypt, about 3,300 years ago. In fact, black seed oil was discovered in the tomb of the Egyptian pharaoh Tutankhamun. The Prophet Muhammad is believed to have once said that black seed is a remedy “for all diseases except death.” There appears to be plenty of evidence to now back up that claim.The many health benefits of black seed have been referenced in 656 published, peer-reviewed studies dating as far back as 1964. Findings froma study published in the Indian Journal of Physiology and Pharmacology in 2010 showed that two grams daily of black seed decreased insulin resistance, fasting glucose, and glycosylated hemoglobin in patients with type-2 diabetes. The study observed 94 type-2 diabetics who were randomly administered one, two, or three grams of black seed for three months. Black seed is also considered an effective treatment for high blood pressure. In a 2008 study published in the journal Fundamental & Clinical Pharmacology, researchers found that 100 mg and 200 mg doses of black seed extract taken twice daily for two months lowered blood pressure in mild hypertension patients. Multiple studies link black seed with suppression of cancer cell growth, including colon cancer. A 2003 study investigated 344 rats for 14 weeks and found that black seed could inhibit colon cancer without any side effects. 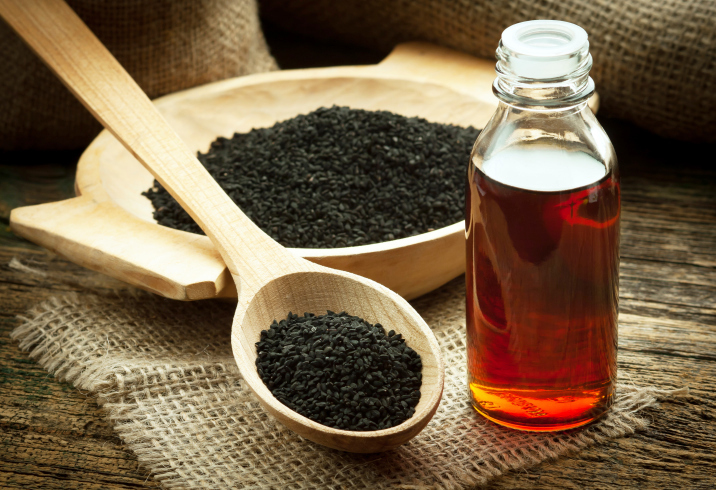 Black seed has also been linked with the suppression of oral, brain, liver, cervical, and breast cancer growth. One of the main active constituents in black seed is thymoquinone, which was shown to have a stronger effect than the common asthma drug fluticasone in an animal study. Also, a human study published in Phytomedicine: International Journal of Phytotherapy and Phytopharmacology in 2010 found that boiled water with black seed extract had a significant anti-asthmatic effect on the airways of 15 asthmatic patients, comparable to the respiratory drug theophylline. The thymoquinone from black seed also has a protective effect in damage from a heart attack, according to a 2013 rat study published in the Pakistan Journal of Pharmaceutical Sciences. This is only the tip of the iceberg with regards to the many health benefits of black seed. Studies also support its use for treating epilepsy, H. pylori bacterial infections, acute tonsillopharyngitis, and psoriasis. Parkinson’s disease complications, and lead-induced brain damage. Furthermore, black seed is believed to be beneficial for allergies, skin and hair problems, cold and flu, nasal congestion, headaches, toothaches, and digestive issues. Ji, S., “Black Seed – ‘The Remedy For Everything But Death,’” GreenMedInfo web site, January 3, 2013; http://www.greenmedinfo.com/blog/black-seed-remedy-everything-death. Bamosa, A.O., et al., “Effect of Nigella sativa seeds on the glycemic control of patients with type 2 diabetes mellitus,” Indian Journal of Physiology and Pharmacology 2010; 54(4): 344-354. Dehkordi, F.R., et al., “Antihypertensive effect of Nigella sativa seed extract in patients with mild hypertension,” Fundamental & Clinical Pharmacology 2008; 22(4): 447-452. Salim, E.I., et al., “Chemopreventive potential of volatile oil from black cumin (Nigella sativa L.) seeds against rat colon carcinogenesis,” Nutrition and Cancer 2003; 45(2): 195-202. Boskabady, M.H., et al., “Antiasthmatic effect of Nigella sativa in airways of asthmatic patients,” Phytomedicine 2010; 17(10): 707-713. Randhawa, M.A., et al., “The effect of thymoquinone, an active component of Nigella sativa, on isoproterenol induced myocardial injury,” Pakistan Journal of Pharmaceutical Sciences 2013; 26(6): 1215-1219. Ji, S., “16 More Reasons Black Seed Is ‘The Remedy For Everything But Death,’” GreenMedInfo web site, November 29, 2013; http://www.greenmedinfo.com/blog/16-more-reasons-black-seed-remedy-everything-death2. Zafar, J., “Black Seed Oil Health Benefits,” HomeRemediesWeb.com; http://www.homeremediesweb.com/black-seed-oil-health-benefits.php, last accessed May 12, 2015.